The flavor here is meant to be that we're predicting a certain kind of problem (drawing too many lands, probably), taking steps to prevent it, benefiting more when we're right and less when we were paranoid. I was struggling with how to word this until it finally occurred to me to use scry in a new way. I don't know how often that'll come up, but I'm confident that when it does, it'll make a big difference. Using scry that way might be a little confusing for some, since the basic definition of the action involves looking at X cards, and they've already done that. I would wonder if people would think they scry an additional X cards. Seems a bit complicated, and scry X can possibly take a long time to resolve. Could you just lock in "lands" as the chosen type? Those seem like obstacles most of the time. Look at the top X cards of your library. Exile any number of lands from among them then scry the rest. 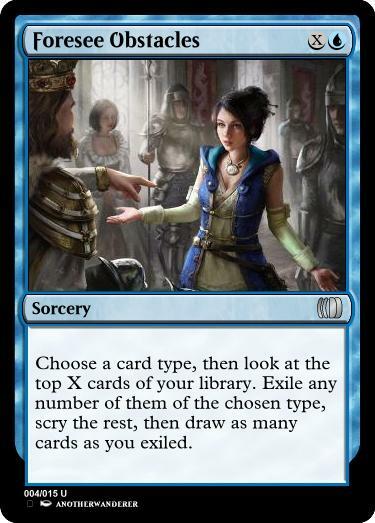 Draw cards equal to the number of lands exiled this way. I had this exact thought. I agree it's a much simpler implementation of what Jay's going for. The only thing I'm unsure of is "scry" vs. just put back on top in any order. Yeah, even if you're running mono-creatures, you still wouldn't play this to thin out creatures and get land. Also ditching X, for clarity. Look at the top 5 cards of your library. Exile any number of land cards among them and scry the rest. Draw a card for each land card exiled this way. Needs some kind of navigating / pathfinding name. Other than the case where you're specifically looking for lands, this is pretty close to 2U - Scry 5 + Draw 2. Sometimes it hits less, but I think you could also pretty easily run a 27-28 land deck and turn this into a powerhouse. I think it's a cool design with some tweaking. It also fits into blue/green, which might help balance it a bit.